Where has the week gone? 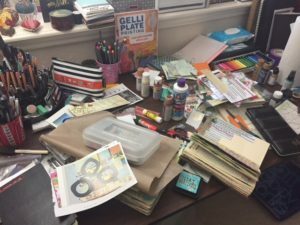 I have been so busy seeing friends, former co-workers, networking, crafting and now things at Casa Bookgirl are getting messy! Here’s a look at one of my craft tables. I think there are various journals underneath the madness. Ha. It’s been a good week though. I have a lot of plans for the weekend… read, bookbinding, going to EAST, and so many other things I want to do. I really need to finish Magpie Murders by Anthony Horowitz as my book group meets next week. The book is good but I’m not sure that I’m loving it. More on this later. Plus, I have to return the book to the library soon. Oh and catching up on book reviews. Can you believe I still haven’t even told you about some of the books that I read while I was on vacation? Thank goodness I kept notes. 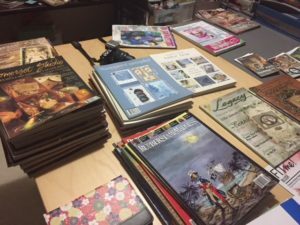 I also want to go through my stash of craft magazines. I hate to get rid of some of these but let’s be real, when do I look through these? So they may find themselves on the destash section of my shop. Going through these though has reminded me of several publications that I really enjoyed and that aren’t in print any longer. I seem to be all over the place in this post. Anyway, tell me about you, what are you up to this weekend? And is anyone tired yet of all the Black Friday/Cyber Monday ads? My inbox is inundated with emails. I admit it’s hard to even think of the holidays around here when I’m wearing shorts and a t-shirt. We’re supposed to hit 84 today. I need iced coffee. Ok, have a wonderful weekend everyone and more bookish talk soon! Oh my gosh I know, this time of year flies by. Thanksgiving is around the corner already! 84 is hot! There’s frost in the mornings here already. Happy weekend and happy reading. I’m still in minor shock that November is over half gone and Thanksgiving just ahead! I’m all over the place right now– in so many ways. Sounds like you have had a busy but enjoyable week and fun plans for the weekend! I did my quarterly visit to Wally Mart. I wanted to go before I ran out of shampoo, toilet paper, soap, etc. And to miss the stampede on Friday. I also picked up my Thanksgiving sides, desserts, and rolls. Last year was my first time in Atlanta. I picked up stuff on Wednesday and almost got in 5 car accidents. So many people running errands! I am so happy not to be in traffic. I’ve been gradually de-layering my workspace too. It’s such a nice feeling to find the surface again (literally and metaphorically). Enjoy your weekend!